Workshops are available nationwide for high school students and educators to develop the latest reporting, publishing and teaching skills. Please browse the directory. To list your workshop in the directory or update a current listing, please complete this online form. Interested in hosting a News Fund Workshop? Find out how to apply here. Workshops are updated annually in January. THE LONG WEEKEND: The Alabama Scholastic Press Association invites middle and high school students (grades 6-12) to attend its summer journalism camp, The Long Weekend, on campus in June. Students can attend with or without their media staffs and advisers. The cost for the weekend is $150, which includes room and board, tuition and all meals. The camp is designed to teach creative and efficient ways to communicate through scholastic newspapers, newsmagazines, yearbooks, literary magazines, broadcast programs and digital media. It allows students to enjoy a taste of college life and invigorate their interest in scholastic media. The Long Weekend will feature day and evening classes to help participants gain the tools to produce prize-winning results next school year. When festivities and classes wrap up with a showcase by campers, students will have a great start on the upcoming year and will leave with a solid plan for their school newspaper, yearbook, broadcast program, website or literary magazine. If they attend the camp without a staff, they will leave with the skills they need to do great journalism in any medium. 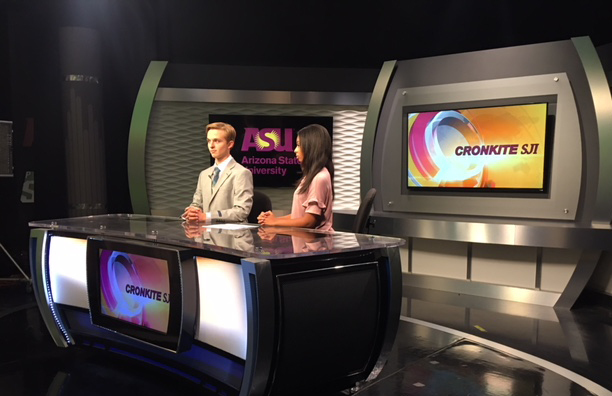 For two weeks every summer, the Walter Cronkite School of Journalism and Mass Communication brings top-performing high school students to ASU for two weeks of intensive, hands-on experiences in broadcast and digital journalism. It is a competitive application process. Students selected to participate are responsible for their transportation to and from the summer residential program. The High School Media Innovation Camp at the Cronkite School offers future journalists, game developers and other students interested in media and technology the chance to experiment with cutting-edge tools, including 360-degree and virtual-reality technology, news games and apps. In partnership with The Arizona Republic/azcentral.com and the USA Today Network, the highly interactive residential summer camp pairs high school students with entrepreneurs, technologists, journalists and professors to create compelling content for digital audiences. Campers will develop projects and pitch their ideas to a panel of judges at the end of the two-week camp. The winners will get an opportunity to continue to work with professionals at ASU, The Arizona Republic/azcentral.com or the USA Today Network. The camp is free to selected participants. Students provide only their transportation to and from the camp. Housing, food and programming are provided by The Arizona Republic's Media in Education program, which is funded by subscribers who donate the value of their subscription during vacations or other temporary stoppages. Students will be based at the state-of-the-art Cronkite School on ASU’s Downtown Phoenix Campus and will have access to the latest digital equipment. Students are housed in a residence hall just steps from the Cronkite building and are supervised by Cronkite faculty and senior students. The camp is open to high school students throughout the state of Arizona who have completed at least their freshman year by the time the program starts. Students must complete an application form and provide a transcript and a letter of recommendation from a teacher or adviser. All materials may be submitted online. Cronkite Sports Broadcast Boot Camp is a special summer camp exclusively for students currently in high school interested in sports journalism. This on-campus journalism summer camp puts participants in the middle of the action covering professional sports teams such as the Arizona Diamondbacks, Phoenix Rising FC Soccer and Phoenix Mercury. Arkansas Soul is a two-week summer travel writing program for minority high school students (Juniors and Seniors only) with interests in digital writing, videography, social media, and photography. The Arkansas Soul project serves two purposes: to train young, aspiring media makers and to reach diverse audiences interested in traveling to Arkansas to experience the natural state. The program is structured to introduce high school students to core journalism and PR skills including digital content and promotion, photography, video production, interviewing and story development for diverse audiences. The program is a prime opportunity to present real-world challenges to motivated students in their home state, generate diverse content and assets, and provide service through a partnership with the state of Arkansas and the University of Arkansas. Participants for this project will be recruited primarily from the East Arkansas/Delta region but we will accept applications from any high school junior or senior with a demonstrated interest and background in digital media. We can only accept 8 - 10 student participants to explore select destinations, cultural landmarks and attractions across Arkansas to produce original content and digital stories that will attract African American and Latinx tourists to our state. Journalism training and workshops will take place at the Sue Walk Burnett Student Media Center at the University of Arkansas in Fayetteville. The California Scholastic Press Association will hold its 68th-annual high school journalism workshop on the campus of Cal Poly, San Luis Obispo, from July 7-19, 2019. CSPA Workshop graduates do more in 13 days than most people do all summer. Whether you’re an experienced student journalist, a beginner or simply a student interested in improving your writing skills, you’ll find the CSPA Workshop beneficial. Our curriculum covers a wide variety of journalism-related areas, including writing, editing, photography, blogging, newspaper and television production, and social media. Students will also tour the local television station and government center and enjoy an afternoon at the beach. Tuition is $1,975 and includes lodging and all meals. The CSPA Workshop has a rolling application deadline. Priority deadline is March 31, 2019. GRAMMY Camp is a 5-day nonresidential summer music industry program for high school students interested in having a career in music. Hosted on the campus of USC Thornton School of Music in Los Angeles, students from across the country apply for one of the eight offered career tracks. GRAMMY Camp faculty of music professionals as well as guest industry professionals provide valuable insight to give the campers the best chance at achieving success in their chosen career. Music Journalism Campers will be reporting on and telling the story of GRAMMY Camp. There will be instruction in effective writing and communication techniques in both traditional and new media outlets including but not limited to online blogging, photo journalism, and journalism practices and ethics. 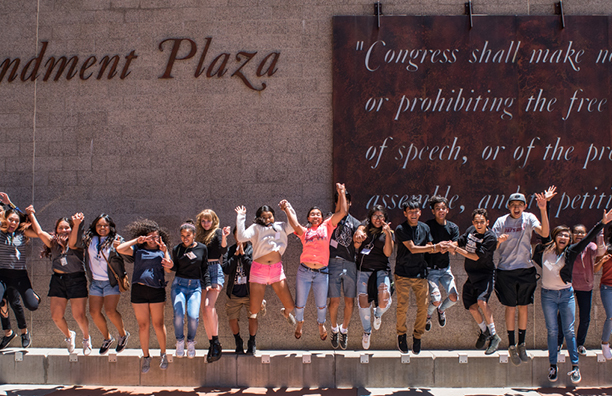 The Mosaic summer journalism workshop at San Jose State University offers high school students an introduction to reporting, newswriting, opinion writing, photography, web posting and blogging. We target students in underserved communities in Santa Clara County, including schools that do not offer journalism classes. With a 4-to-1 student-instructor ratio, and with a 2-to-1 student-adult ratio, Mosaic offers intense instruction and guidance from news media professionals. In two weeks students produce a print and online newspaper. San Jose Mercury News reporters, photographers and Mosaic alumni make up the teaching staff. One of the nation’s leading digital journalism camps for high school students, Newsroom by the Bay helps students learn and practice journalism basics using the latest tools in online publishing, digital and social media. NBTB students attend morning classes and work in news teams every afternoon to create and publish stories, photos, videos and social media via their own websites. They are taught by award-winning journalism educators, meet working journalists for master classes and lectures, design a team reporting trip to San Francisco and stay on campus where they enjoy Stanford’s world-class museums and athletic facilities. A Year 1 strand is available for students new to online journalism and Year 2 for returning students and counselors-in-training. Residential students pay $2,545 including tuition, housing, dining, program materials and all field trip and transportation fees; commuters pay $1,545 for tuition, program materials and fees, daily lunches and two dinners. Students need not have digital media or journalism experience to attend. Admissions are rolling but the payment deadline is April 1 and registration packets are due May 1. For more information, email newsroombythebay@gmail.com or click on “Apply” at www.newsroombythebay.com. Ignite Yearbook University takes place annually on the campus of Pepperdine University in sunny Malibu, California. Each summer we provide the most comprehensive educational experience in scholastic media. Curated and instructed by industry-leading professionals. Offers programs on storytelling, photography, design, software and marketing. SAW, the workshop that has provided insights, feedback and pragmatic advice for hundreds of Colorado media advisers over the years, returns June 5-7, 2019. The workshop is again at Rock Canyon HS in Highlands Ranch. This is a commuter camp, but beverages, lunches, and snacks are provided all three days. This workshop runs concurrently with the reTHINK workshop. Sessions will be led by some of the state’s most successful and inspiring advisers, including opportunities to work with the faculty of the reTHINK workshop. SAW will provide instruction in class organization, advising philosophy, grading methods, professional support options, multimedia basics and hands-on training, and teaching writing & reporting. There is one registration fee for everyone: $150 per person. Please register using this online form, and you will have a chance to pay registration fees by credit card at the end of the form. We also accept checks, either mailed or delivered the first day of the workshop. reTHINK is back for its 14th year, returning to Rock Canyon HS in Highlands Ranch, and again is paired with the CSMA Summer Adviser Workshop. The workshop is condensed to three intense days this year, Wednesday through Friday, and is a commuter camp. Lunch and snacks are included each day with your registration. Our experienced instructors will meet you and your students wherever you are, whether the students are ready to take their publications to the next level or whether they are starting from scratch, whether they have had three years on staff or no time on staff. We begin each day at 9 a.m., and end about 4 p.m. Snacks and lunches are provided to maximize available learning time. Everything is included in our per person cost of $150. You even get to take home copies of PowerPoints and handouts shared during the workshop. Students may attend without their advisers, but we highly recommend advisers attend so they will be part of the discussion, part of the instruction, and part of the decision making that tends to come out of these three intense days. reTHINK is sponsored by the Colorado Student Media Association, and runs concurrently with the CSMA Summer Adviser Workshop, which focuses on management, leadership and instruction issues that support advisers. The Yale Daily News Summer Journalism Program is a one-week intensive course in journalism for high-school students. The program is run entirely by undergraduate staff members of the Yale Daily News. During the course of the week, the high-school students participate in workshops on the fundamentals of reporting and writing, attend lectures by guest speakers from major national publications, and work hands-on reporting a story. The week culminates with the production of an issue of the Yale Daily News. While any high-school students with an interest in journalism, writing or photography may apply to the Summer Journalism Program, we are not able to provide housing for the program. Students are expected to return to their own lodgings, be it home or otherwise, each evening. Students must provide their own lunches and transportation to and from campus. As a result, we generally encourage Connecticut residents who can easily travel to the Yale Daily News every day to apply to the program. But we also welcome any high school student who can find housing within commuting distance of the Yale Daily News building in New Haven to apply. The program lasts from 10 a.m. until 4 p.m. each day. The Yale Daily News Summer Journalism Program is free to all participants from New Haven public schools. We ask that all other participants pay $200 for their week spent with the Yale Daily News in the program. The Yale Daily News uses this money to help keep the Yale Daily News free for all readers and fund various initiatives within the Yale Daily News, such as reporting fellowships, financial stipends for low-income students on the Yale Daily News and events like the Summer Journalism Program. Now in its ninth year, the C-HIT Summer Reporting Workshops provide select high school students with the opportunity to develop investigative reporting, video and digital journalism skills in a unique learning environment led by distinguished local and national journalists. At Quinnipiac University from July 8-12, students will focus on multimedia storytelling, including how to report and write news stories, use social media to report and promote stories, and produce photographs and video stories. At the University of Connecticut from July 15-18, students will learn the basics of digital journalism, including podcasting, shooting and editing videos, and how to report and write news stories. High school students, ages 16 and older, with an interest in journalism are eligible. June 18, 2019 - July 20, 2019 American University Washington, D.C. Welcome to Discover the World of Communication, where you will learn to build a digital portfolio, write a script, shoot and edit a film, write a news story like a pro, speak with confidence, persuade, inform, educate, and entertain. Our professional, hands-on workshops-open to students entering grades 9 through 12-are taught by American University School of Communication faculty and communication professionals. During class and after hours, you can explore the city from a variety from a variety of angles. View live television and radio broadcasts at local studios such as NBC4, WTTG Fox 5, NPR, and ESPN Radio, cover a Nationals baseball game or WNBA game from a press seat, and tour local attractions including the National Zoo, the Newseum, National Cathedral, Georgetown, and the Smithsonian museums. Upcoming sessions are June 18-28; July 1-12; and July 15-20. The University of Florida Summer Media Institute is a five-night, six-day camp in which high school students are immersed in journalism and communications. Take part in an assortment of electives and specializations, and learn from award-winning UF instructors and industry stalwarts. Seize the hands-on opportunity to spend time in state-of-the-art university facilities – and to begin preparing for careers in the rapidly changing media environment – at the home of one of the largest and most comprehensive journalism and communications programs in the nation. Students with a passion and talent for storytelling and communication are especially invited. The fee is $950 until registration closes May 31. The fee covers all lodging, meals and programming, however, participants are responsible for their travel to and from Gainesville. If you are a high school student interested in telling compelling stories through photo, video, audio, and the written word this camp is for you. You won't spend your time cooped up in a classroom; you'll get out into the community, practicing new skills with professionals guiding you. We'll also have many fun activities (this is camp, after all). In eight days, campers learn or improve their knowledge of, and skills in, DSLR cameras, Premiere, Photoshop, Audition, writing for the web and more. Many students will receive full scholarships to attend for FREE, thanks to a grant from The John S. and James L. Knight Foundation. The full cost of the camp is $595. Turner Voices Youth Media Institute is a week-long intensive “All Things Turner” program focused on leadership and media career development held the last week in June on the campus of Georgia Institute of Technology in Atlanta. Ever wanted to go behind the scenes during a newscast or learn the ins and outs at any Turner’s network? Here’s your chance to learn more about the media industry, the wide array of career opportunities available and the leadership skills it takes to make it in any business. Sponsored by Turner, Turner Voices Youth Media Institute takes you through a jam-packed week of workshops and roundtables led by & Turner executives, in-depth tours of CNN or Turner Studios and dynamic networking events with Turner employees. Plus, you’ll “make the pitch” to Turner executives at week’s end in a competitive, team-based media challenge. JCamp is a six-day intensive, multicultural journalism training program for high school students. Students learn from professional journalists and get hands-on training in writing, reporting, photography, television and radio broadcasting, online media and data journalism. Sessions and workshops are led by experienced journalists from top media companies. JCamp is an all-expenses-paid program with travel, meals and lodging covered by AAJA’s donors and partners. JCamp 2019 will be hosted by Georgia Public Broadcasting in Atlanta, July 27 - August 1. Read more about what’s in store for JCamp in 2019. Selected students will stay in dorm-style suites at Georgia State University, supervised by adult chaperones at all. times. The deadline to apply is Sunday, March 31. The 360° Entertainment Camp is a 6-day residential program for all students who will be in grades 9-12 in Fall 2019. Students get hands-on experience about entertainment media from every angle for $499 with some scholarships available. Learn from College of Media faculty and pros in the field: create multimedia content, including blogging and podcasts; operate drones and GoPros for video production; write first-person commentary and film reviews; discover how to brand yourself and your ideas. Attendees will have plenty of time to attend evening activities, field trips and explore the Urbana-Champaign campus. Space is limited, so sign up early! The Medill-Northwestern Journalism Institute is a five-week journalism program for about 80 rising high school seniors at Northwestern University in Evanston, Illinois. It covers various aspects of journalism including reporting, writing and editing for print, broadcast and digital media; editorials, columns and blogs; news and feature photography; audio and video. By the end of the summer, students create a body of work, build connections and meet aspiring journalists from around the world. The cost is $5,900, which includes tuition, room and board, and health service fees. The Institute has nearly $100,000 in scholarships and financial aid available for 2019 students. Located at Ball State University in Muncie, Indiana, this uniquely-structured workshop offers cutting edge courses for staffs and advisers in our state-of-the-art facilities on one of the most beautiful college campuses in the nation. Journalists and advisers will attend a five-day workshop to hone the skills necessary to hit the ground running when school resumes in the fall. Of course, the fun factor of BSU Journalism Workshops is off the charts! With a volleyball tournament and game nights, free time is filled with activities. For more than 50 years, BSU Journalism Workshops has set trends and trained staff members, student leaders and advisers in broadcast, web, news, yearbook, social media, mobile journalism and more in our innovative programs using cutting-edge technology. Join us for an immersive learning experience at Indiana University Bloomington, where high school students participate in hands-on workshops to practice and improve their skills, and high school advisers take advantage of collaboration with seasoned pros or develop independent projects. Attendees stay in IU residence halls and attend workshops at The Media School in Franklin Hall, and they have all of campus and the city as a backdrop to their projects. The 2019 workshops are July 8-12, July 12-14 and July 14-18. Join us at Drake University for our third summer in Des Moines, where students and advisers choose a single-track to immerse themselves in for the four days they are with us. Participate in hands-on projects and showcase them in a campus-wide awards ceremony to cap off our time together. It’s an awesome opportunity to deep dive into that area of interest and hone your skills. No matter what level you arrive with, we’ll push you, encourage and train you to move to the next. Classes Include: Editorial Leadership, Beginning Writing, Advanced Writing, Photography, Video, Design, Yearbook, Political Communication, Sports Journalism, Advising Publications and School Newspapers Online (SNO) will be there to help staffs with their online news sites. For 66 years, the world’s most prestigious writing university has served the country’s best high school journalists at the University of Iowa Summer Journalism Workshops. Workshoppers are divided by topic such as photo, design, yearbook, investigative reporter, editorial leadership, personal writing. Students live on campus. There are also two online for credit classes for instructions offered. Join us in the Little Apple for 2.5 days of Wildcat fun, fellowship and journalism learning with several of the best high school advisers in the Sunflower State. Water balloons, bowling, ping pong tournaments and a pool party are all built into a workshop experience unlike any other! For more that 50 years, the University of Kansas has hosted summer journalism camps for high school students. Learn just about any type of media: web, yearbook, news publications, video, photography. Join us for five days of exciting learning at KU. Rock Chalk! Prepare your staff for excellence at the Jayhawk Media Workshop. The 5-day workshop combines decades of excellence in summer workshop programming, award-wining faculty and hands-on computer labs. While on campus at the University of Kansas, students are challenged with the newest skills and learn the latest trends in journalism. Combine that with fun social activities for a great week of journalism. The Western Kentucky University School of Journalism & Broadcasting is looking for outstanding students — especially those from backgrounds under-represented in U.S. newsrooms or who might lack financial resources — to participate in its Xposure Journalism Workshop. The program seeks students with interests in news writing, editing, photography and journalism as a career. During the workshop, students gain important skills through classes, seminars, educational field trips and work with WKU journalism professors and other professional journalists in a learn-by-doing environment. Students report, write, edit and shoot photos for stories published in a newspaper and posted on the workshop’s website. Come join us this summer at the Institute for Environmental Journalism. Learn from award-winning journalists and instructors, immerse yourself in climate science, go off-site on reporting trips, hear from guest speakers, and most importantly spend the afternoons reporting and producing an original piece of publishable journalism they will complete by the end of the Institute. Presented with the New England Center for Investigative Reporting, this three-week workshop will train students in core journalism skills as well as more advanced investigative techniques such interviewing reluctant sources, filing public document requests and digging through data. Students will apply these lessons during the workshop by reporting as a team outside the classroom, conducting interviews and research from campus and in the city of Boston. This year’s focus: health and safety. As a capstone, students will complete an investigative findings memo, story outline and lead. Students with experience in news writing or journalism, such as working for their high school news site, will benefit most from this workshop. Rochelle Sharpe, a Pulitzer Prize-winning journalist and former staff reporter for the Wall Street Journal, Business Week and USA Today, will lead the workshop. Based on participants' priorities, sessions will include how to •keep a journalistic balance •deal with legal and ethical considerations •teach the staff to cover the school and its community •teach the staff to write and edit news, features, sports and opinion along with maintaining a lively forum for student opinion •motivate the staff •teach fundamentals of photojournalism and design •maintain a good relationship with faculty and parents •use special pages, special sections and spreads as training vehicles •plan, set goals and schedule copy flow for print and online •manage the business side •critique the publication •make the most of professional resources. In addition to a variety of lab assignments, participants will present critiques and complete curriculum projects. There will be lectures, discussions and lab work. Sessions will be 10-4 with a break for lunch. The fee is $200. Parking will be available. The deadline for registration is Friday, June 7. All-expense-paid program for high school students interested in pursuing a career in journalism. The program is in partnership with The Boston Globe, Regis College, Simmons College and the New England Newspaper and Press Association. You are a writer. A photographer. A designer. A broadcaster. A maker. You make websites, yearbooks, newspapers and broadcast programs. You make work that seeks to make a difference in your school and in your community. And MIPA can help you make that work even more special. Explore what you can make at the 2019 MIPA Summer Journalism Workshop. You’ll spend five days on Michigan State University’s campus working with some of the best instructors in the nation. Then take what you learn back to your school newspaper, yearbook, video production or news website. Don’t work on a student media staff? Our journalism-focused curriculum provides skills and techniques that you can apply in a variety of areas — from class to life. Become a better writer, explore print or digital media creation and find your voice. You’ll make new friends for life, and we guarantee you’ll leave ready to make an impact on the world. Have you ever been published? Would you like to be? Life of a Story is an amazing summer journalism workshop that will put you in touch with artists in the Twin Cities so you can tell their stories on Orca Tribe. Classes meet in the morning at St. Paul Academy and Summit School Randolph Campus, for one week in June and feature guest writers from the Star Tribune and Minnesota Public Radio. In just one week, students will learn to conduct meaningful interviews and to write a full-length feature story. Note that this runs for a week in June and then three additional days in July for a total of 8 days to enable students to fully develop their work. Tuition: $295. Open to: Students entering grades 9-12 in fall 2019. All students are welcome to attend Summer at SPA programs; participants do not need to be enrolled at SPA to participate. ThreeSixty Journalism, an intensive multimedia program for high school students, is part of the College of Arts and Sciences at the University of St. Thomas. ThreeSixty trains and supports the next generation of diverse thinkers, communicators and leaders. At ThreeSixty’s two-week News Reporter Academy you’ll learn about the different opportunities in media and communication, engage in related activities, hear from experienced journalists and communicators, and set the stage for writing a reported story that will be published in both the print and digital versions of ThreeSixty Magazine! Week one is July 8-12 and week two is July 15-19. Discover the fast-paced world of professional journalism! Learn how to cover issues, news and current events. Your instruction will be guided by faculty experts at the Missouri School of Journalism and industry professionals. Skills you will work on include: Mobile Technologies, Social Media, Documentary Journalism and Data Journalism. Cost: $675. Includes workshop activities, on-campus lodging, meals and local transportation. Scholarships available. At the world’s school of journalism, real-world media experience is part of the curriculum. Learn how investigative journalists find information, track people down, conduct better interviews, analyze data and find great stories. You’ll leave with skills you need to do your own investigations. The workshop is taught by investigative reporters who have worked at top news organizations such as The New York Times and by experienced MU faculty. Cost is $675. Includes workshop activities, on-campus lodging, meals and local transportation. Scholarships available. Join us at Webster University for a day camp experience presented conference-style. We are offering over 100 different topics to fill your schedule and melt your mind. Choose from a variety of critique sessions, leadership trainings and best practices for storytelling to round out your three-day experience with us. Workshop sessions span in topics from design, writing, photography and video to web design, social media and iPhone storytelling. You’ll have an opportunity to deep dive into illustrations, infographics, video stand-ups, interviewing techniques, photo essays and mobile video editing. Special tracks and hands-on workshops will also be available. This Media Now Day Camp format at Webster will be offered June 24 – 26, 2019 running 8:30 a.m. to 4:30 p.m. each day. Learn from professional journalists, collegiate faculty and high school advisers. A program for high school students designed to prepare them for college and potential fields of study within journalism and communications. Students will engage in hands-on training with various forms of communication media and will learn reporting skills across multiple platforms. The Princeton Summer Journalism Program (PSJP) is a free journalism and college preparatory program for current high school juniors from low-income backgrounds who are interested in journalism. During our intensive 10-day summer program, students engage in workshops, lectures, and activities led by Princeton professors, professional journalists, and PSJP alumni. The program culminates in the publication of the student-produced Princeton Summer Journal. During the senior year, students are also matched with a volunteer college counselor, a professional journalist or program alum, who will guide them through the college application process. To apply, visit psjp.princeton.edu. New Mexico high school students are invited to come to the University of New Mexico on June 2-5 to learn the ins and outs of newspapers and journalism. The 2019 version of the workshop will include the same three-day program that gives students a taste of all aspects of print and digital newspaper production. The students will learn from top professionals and educators in New Mexico how to report and write articles for print and online newspapers. They will learn the basics of photojournalism, copy editing,page design and journalism ethics over the course of the workshop. Cost for the workshop is $150, but scholarships are available and no student will be turned away. For the price of admission, students will stay at the University of New Mexico dorms. Meals will be provided. At the end of the workshop, the students will have produced a print and online version of The Future Press. Several years ago, NBC approached the New York Film Academy to start an education program where aspiring broadcast journalists could acquire the real-world skill set necessary to thrive in broadcast TV, cable, and internet news. Now, we extend that same caliber of training to teens in our 3-Week Broadcast Journalism Camp, located in the international news capital of New York City. Through study and hands-on practice, camp students are trained in the fundamental principles, techniques, and craft of broadcast journalism. This is accomplished through a combination of lecture, demonstration, hands-on production, and the students’ own work. Students study under our world-class faculty, whose work has been seen on local and national television as well as cable and digital platforms. Each student produces two projects, shot with single-camera setups and edited on industry-standard editing software. This intensive workshop provides a strong introduction to necessary digital and journalism skills. Many of our camp graduates have gone on to further study or internships, which were greatly helped by the foundational skills they learned at the Academy. Tuition and fees is $3,335, room and board is additional. This intensive, seven-day residential summer workshop is designed for current high school sophomores and juniors considering careers in journalism. The workshop introduces students to basic skills in news reporting, writing and editing and the use of video and still photography. Classes are taught by professional journalists. Students will live at the University and work in the School of Journalism’s multimedia newsroom. As a culminating activity, students will produce original work across several media platforms. There is a fee of $500 to be paid upon acceptance into the program which covers room and board, but all other expenses including tuition are covered by charitable contributions. Scholarships are available in cases of financial hardship. Summer Academy at The King’s College is a week-long camp designed for high school students who love ideas and want to understand the moral and intellectual foundations of modern society from a biblical worldview. Through original source readings, lectures, and discussions you will broaden your understanding of the ideas that animate our society. You will experience New York City through visits to museums, historic sites, activities, discussions, and other attractions. Summer Academy students can choose to study under one of the following tracks: Sports & Entertainment Journalism, Arts & Culture Reporting, Visual Storytelling & Design, Philosophy & the Good Life, Economics of Foreign Aid and Christian Leadership and the American Founding. Presented by CSPA and hosted by Columbia University, the annual Summer Journalism Workshop is a week-long conference offering sequences focused on either writing, editing, management or advanced design. For secondary school students and teachers from schools in the U.S. and international schools following an American plan of education. The Carolina Sports Journalism Camp is now accepting applications. Rising high school juniors and seniors with an interest in sports and media are encouraged to apply. This four-day residential workshop will include instructional sessions on sports broadcasting, sports writing, sports photography and much more. Students will be housed on UNC-Chapel Hill’s campus. The camp will feature visiting sports reporters and sports personalities. Students will take a behind-the-scenes tour of UNC’s sports media facilities. They will cover a press conference, write a sports feature story and experience what it's like to work on a sports media deadline. Registration fee of $550 for in-state students and $1,100 for out-of-state students covers lodging, meals, instruction, press pass and camp T-shirt. The 2019 Chuck Stone Program for Diversity in Education and Media will be held July 7-11. The Chuck Stone Program welcomes students of varying diversity, including but not limited to religion, ethnicity, socioeconomic status and gender. The 12 students accepted to the program will learn from classroom study, real-world reporting, newsroom practice and professional mentors. The workshop will feature multi-platform storytelling and writing. The North Carolina Scholastic Media Institute will be June 17-20 in the UNC-Chapel Hill School of Media and Journalism. High school journalism students and their advisers are invited to enroll. This intensive four-day workshop teaches innovative and effective ways of communicating through scholastic media. Instructors from across the state and nation offer their expertise in news (online, broadcast and print sequences), yearbook, literary magazine, photojournalism and design. Students have the opportunity to create a news broadcast, develop a workshop newspaper, collaborate on an online news site, participate in a leadership boot camp or register for a creativity boot camp. Workshop tuition scholarships are available for North Carolina students. At no cost to attendees, the Center for Scholastic Journalism at Kent State is offering a week-long immersive workshop for advisers with at least five years experience to help them upgrade their skills and expand their knowledge. Topics include digital content management, solutions journalism, data reporting and augmented reality. University creditor CEUs available also available. Students will explore journalism from multiple perspectives — all of which reflect the changing nature and growing demands of the craft. The workshop will include faculty from the School of Journalism and the School of Visual Communication, as well as staff from WOUB. In addition, several visiting professionals will serve as classroom instructors. The 2019 workshop fee will be $300, which includes room and board for the program, attendance at the sessions, and all materials. Diversity scholarships are available to students through support from the Scripps Howard Foundation. Ohio University's 2019 High School Journalism Workshop will include: opportunities to experience the latest journalism techniques, diversity scholarships that cover up to 100 percent of the cost of the workshop for students, an opportunity to spend time on Ohio University's historic Athens campus, and the chance to earn college credit! The Oklahoma Institute for Diversity in Journalism offers an annual workshop for promising high school students, scheduled each summer. The program’s goal is to expose youth to careers in the world of daily journalism. OIDJ’s mission is to provide opportunities for students who would otherwise lack access to journalism training or who face other barriers to pursuing careers in journalism. The program is funded by several organizations including the Dow Jones News Fund, the Ethics and Excellence in Journalism Foundation and the Gaylord College of Journalism and Mass Communication at OU. Selected students will be given free room and board in a residence hall on the University of Oklahoma campus. Supervision of their stay will be provided at all times by peer counselors and OU staff members. Participants will attend training sessions throughout the day and evening in the state-of-the-art facilities of the Gaylord College of Journalism and Mass Communication. Participants will research, report, write, video and edit stories on a variety of topics and news events. Instructors will come from a variety of educational institutions and professional media organizations. The OJEA Summer Adviser Workshops are back! We will be returning to Southern Oregon University in Ashland, Oregon for the workshops July 22-25, 2019. We will be offering strands in Print Publications, Web/Multi-Media, and Broadcast Journalism. Whether you are a veteran or beginner, the workshops will have valuable content for you. This is a great opportunity to improve your skills, log PDU or CTE hours and get college credit if you choose. After hours, enjoy the nationally respected Oregon Shakespeare Festival. Next Generation Storytelling is a summer residential experience at the University of Oregon that will empower high school students to develop their critical thinking, leadership, and entrepreneurial skills while building strong voices as effective communicators. With a focus on emerging technology and media, NGS immerses residents in current and future best practices in journalism, media studies, advertising, and public relations. Students will participate in hands-on, experiential learning through courses that challenge them to explore journalism and media. They will also hear from featured speakers ranging from prominent journalists to executives of major media companies. The program will also offer the opportunity to see modern working media facilities. Program costs $950. Digital journalism represents the future of storytelling. Campers will write, produce and edit content while working alongside seasoned journalists. Campers will develop essential storytelling skills using photography, video, writing and social media as well as emerging technologies such as augmented reality, virtual reality and 360 video. Campers will hone their production and writing skills. They'll also learn about interviewing, and practice that vital skill, while covering live events. They will also visit a working newsroom. Sessions provide a focus on a variety of approaches and topics, including: arts and culture; photojournalism; social media; sports; and even weather-related news. Examples of previous camp events include: Central Pa. Festival of the Arts, covering live sporting events, interviewing an astronaut, and visiting the Penn State dairy farm. No experience is necessary. You need only to want to learn. And you'll be able to do that while using professional cameras, including 360-degree cameras, as well as becoming proficient in Adobe Premiere, the industry standard software. If you are between the ages of 17 and 19 and want to gain experience in the exciting world of journalism, answer the call to enroll in The Morning Call’s newsroom class. The Morning Call Academy offers hands-on instruction in reporting, writing and multimedia.This is a three-week program Monday through Thursday starting July 8, 2019, where the students will spend 5 hours per day (Monday-Thursday) learning from our professional journalists. Penn State's state-of-the-art television studio provides a home for campers who choose this option. Students will work in the same newsroom and studio used by award-winning Penn State students as they learn about TV news and sports productions. It's an opportunity to explore essential broadcast journalism skills, newsgathering techniques, storytelling and more. The hands-on sessions led by full-time faculty and staff members will allow campers to produce their own news or sports video story from start to finish. Students will have an opportunity to record their video and interviews, as well as write and edit their story. They'll also gain insight into other areas of TV news/sports from experienced professionals who have worked in the TV industry for years. Along with faculty, students in the broadcast journalism major at Penn State will serve as counselors, providing an additional resource for those interested in the field. 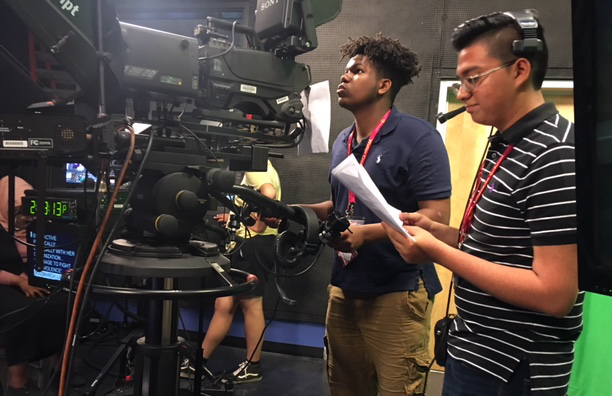 This camp is a good option for those students considering a career in either on-air or off-air television news and sports (including reporting, anchoring, producing and videography). The Carolina Journalism Institute at the University of South Carolina is a four-day summer institute devoted to helping high school students and advisers enhance their knowledge of cutting-edge journalism techniques and standards for their publications and productions. You will connect with other media students and advisers, develop collaborative journalism tactics and learn how to implement your skills across platforms and in your production room through a team-based project. At CJI, you will be placed in a group with three or four other students, and your group will be assigned a beat to cover for a final project. Each group member should take a different angle or approach to covering the assigned beat. By the end of the week, each person should have one written, one visual and one social media element. After CJI, you will be able to take these projects back with you to your media production class, no matter what type of publication or production you work on. Literary magazine, yearbook, newsprint, broadcast and online media students alike can benefit and learn from sessions, and the project teaches all students how to work in a group and to use programs and resources they can use in their journalism classrooms. THSPA partners with Lipscomb University to host J-Camp -- a five-day intensive program to help young journalists hone their journalism skills in writing and other media, meet with professionals in the field, and give students the opportunity to bring their high school publications to a whole new level. Students and advisers from across the state will have the chance to learn and have fun together. Advisers may earn continuing-education credit. As the face of instructional journalism continues to evolve, there are lots of new areas for students to learn and grow. We hope you will join us in Dallas this summer for the opportunity to sharpen and gain new skills in the areas of photography, graphic design, advertising, writing, leadership and more. This is the second year the Gloria Shields Workshop, which has educated thousands of high school journalists for 38 years, has partnered with National Scholastic Press Association, which has a 98-year history of educating student journalists. Since 1980, ILPC summer publications workshops have set the standards for excellence. Our workshop prepares students for the upcoming school year. Whether the students are honing their writing skills or developing the yearbook theme, they all focus on the future — the 2019 school year. For three days, our instructors push your students in intensive learning environments, headed by many of the nation’s finest journalism instructors. These instructors are dedicated to one goal: helping others create the finest journalism in the nation. Students and advisers alike return to school in August ready to tackle their jobs, whether they’re beginning reporters or veteran advisers. We offer classes in UIL writing contests, new media and video editing, various newspaper and yearbook strands, photojournalism, design, sports media and journalism boot camp, which allows students to have one day of instruction in design, writing and photojournalism. Tuition, room (double room/community bath) and board is $240 per person. Registration closes June 1. The Mayborn School of Journalism Multimedia High School Workshop is a week-long residential workshop designed to give students a hands-on experience in storytelling a multimedia world. The first segment of the workshop will be held at the Mayborn Literary Nonfiction Conference where students will meet noted authors and aspiring writers. They will also tweet and write blogs. At the UNT campus in Denton students will be challenged even more and will create a multimedia production by the end of the week. Eligible students are incoming high school juniors, seniors and seniors who have graduated just prior to the workshop. The workshop fee is $250, which covers hotel, food and all expenses except for transportation to Grapevine and from Denton before and after the workshop. The Utah College Media Alliance hosts an annual boot camp to provide media and journalism training to high school students. Student Voices Matter is the theme of the 2019 Utah Media Boot Camp. Our goal is to help train and enable high school journalists to express their voice and contribute to their school communities. The Virginian-Pilot Journalism Workshop offers high school and college students the chance to learn about journalism, to meet other students with similar interests in news, and to have fun! Students are immersed into print and online journalism and includes sessions on writing, reporting, photography and how to engage audiences through social media. Classes are taught by staff at The Virginian-Pilot and Daily Press. The program is free, though transportation will not be provided to the downtown Norfolk office. Attending the Virginia Yearbook Workshop will put you amazingly far ahead. We motivate staffs to create the theme and develop the ladder, as well as begin working on design templates for the entire book. This is the perfect opportunity for middle or high school or college yearbook staffs to come together, set goals and walk away with a jump-start for their next yearbook. The Virginia Yearbook Workshop is sponsored by the local Jostens Yearbook representatives in Virginia, Washington, D.C. and Maryland. You do not have to work with Jostens to attend. George Mason University is the host of the Washington Journalism and Media Conference (WJMC) and each summer welcomes high school student leaders from all over the country as National Youth Correspondents. National Youth Correspondents join the Mason community which includes students and faculty from all over the world. Mason is both the largest public university in Virginia and one of the most culturally diverse universities in the nation. This summer’s conferences will take place July 7 to 12 and July 14 to 19, 2019. Mason attracts proven and innovative leaders in communications, media research, new media, and electronic journalism. Faculty members have developed the WJMC curriculum to suit the needs and potential of the nation’s most talented future leaders in the field. The conference curriculum includes hands-on learning with industry leaders from the Mason faculty as well as international media outlets and Washington insiders. National Youth Correspondents will experience an integrated and forward-thinking approach to journalism and media, while acquiring valuable “in-the-trenches” knowledge. Tuition to attend the Conference is $2,100. Are you a journalism student or adviser that would love to learn about your craft from some of the best instructors in the nation? Then register today for jCamp 2019, a five-day workshop like nothing else in the state. While at camp, you won’t just sit in a classroom hearing about journalism. You will do it! Located at James Madison University, home of The Breeze, jCamp is all about giving you the tools to create a dynamic, successful publication in the coming year. This year, we are moving to storytelling strands. Each camper will work with an instructor who will teach them all the basics of journalism. Campers will also get to choose from a wide variety of break-out sessions each day so they get the opportunity to explore all facets of journalism including photography, videography, writing, design, law and ethics, social media/digital journalism and so much more! Advisers can attend with their students or students can come individually. Students stay in the dorms at James Madison University, and meals are included in the registration fee. The Kettle Moraine Press Association's Summer Journalism Workshop is rich with tradition and excellence. Our four-day workshop provides students with one of the best educational experiences in the nation, with some of the best instructors. On top of that, we firmly believe the "camp" experience is equally important. Our KEMPA Kampers have a blast getting to know one another in our unique house system and challenges. KEMPA Kampers stay in dorms on Marquette's campus in the heart of Milwaukee, which provides our camp with access to a number of opportunities for storytelling, team building, and more. It also means that we are a short distance from many forms of transportation if you are coming in from far away. We have some of the best instructors in the country, with one of the strongest curriculums. Our curriculum is tracked and provides students with a variety of learning experiences geared toward each student's ability level and experience. Our instructors develop the courses to provide for a wide variety of skills and interest levels, all in an effort to make every KEMPA Kamper the most successful he or she can be.